The Plantronics Explorer 220 has been discontinued. No direct replacement is available. 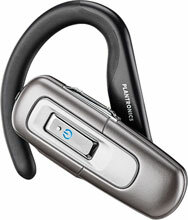 The latest addition to the Plantronics Explorer family is an outstanding entry-level Bluetooth headset. It has been produced specifically for first-time buyers and delivers great battery life to match that of similar class mobile phones. It is lightweight and designed for maximum style and total comfort. With a 10-meter range and an omnidirectional microphone, the Plantronics Explorer 220 will give you great sound at a great price. QuickPair technology ensures it is easy to connect to any Bluetooth-enabled device. Controls such as volume, call answer and call end are simple to use, and there is a handy LED to indicate incoming calls, missed calls and low battery.